Allergy Advice: Contains Wheat, Tree Nut. Product may also contain soybean and egg.. 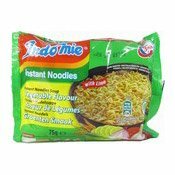 Ingredients: Noodles: Wheat Flour (70%), Refined Palm Oil (Contains Antioxidant (E319)), Salt, Acidity Regulators (E452(i), E501(i), E500(i)), Thickener (E412), Colour (E101(i)). Seasoning Powder: Salt, Flavour Enhancers (E621, E627, E631), Sugar, Yeast Extract, Pepper, Artificial Flavour (1.9%), Garlic Powder, Leek, Onion Powder, Acidity Regulator (E330), Lime Flavour. Seasoning Oil: Refined Palm Oil (Contains Antioxidant (E319)), Onion, Garlic, Lemongrass, Galangal, Bay Leaf, Lime Leaf, Turmeric, Ginger, Candlenut (Tree Nut). Simply enter your details below and we will send you an e-mail when “Indomie Instant Noodles Vegetable Flavour (營多印尼麵 (蔬菜檸檬味))” is back in stock!